You can set a vacation reminder directly from the Gmail app, perfect for letting friends, loved ones, and coworkers know that you're away from your desk. You can set a vacation reminder directly from the Gmail app, perfect for letting friends, loved ones, and coworkers know that you won't be replying for a good long while. Tap the menu button in the top-left corner of the screen, scroll down and tap Settings, then tap the Gmail account for which you'd like to set an out-of-office message. 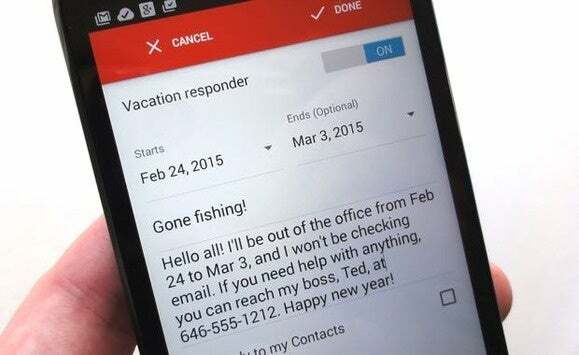 Tap Vacation responder, then fill in the start and end dates, a subject line, and the body of your message. Checking the box next to "Send only to my contacts" will ensure that only people you know will get the message. 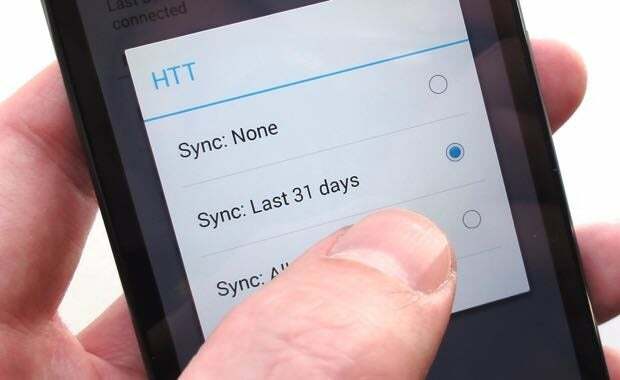 Flip the "Vacation responder" switch on, then tap Done. Tap the menu button in the top-left corner of the page, then tap the Settings button (the one shaped like a gear) next to your email address. Flip the Vacation Responder switch, then fill in the blanks—you know, start and end dates, subject line, message, and so on. Tap the Save button. Bonus tip: Any vacation message you set in the web version of Gmail will automatically sync with the Vacation Responder settings for the Gmail app, and vice versa. Gmail makes it easy to "mute" an annoying thread. Gmail makes it easy to "mute" an annoying message thread—like the kind where everyone chimes in with a "congrats!" or "so cute!" or "see you there"...over and over again. Once muted, the thread won't appear in your inbox again unless you're the only person in the To field. See a message thread you'd like to mute? Open it, tap the three-dot (for Android) or down-arrow (for iOS) menu in the top corner of the screen, then tap Mute. Want to unmute a message? Search for "is:muted," open the muted message you'd like to unmute, then move it back to the inbox. That'll clear the thread's Muted label. You can set the Gmail app to automatically sync some or all of your folders, not just the inbox. By default, the Gmail app syncs only your inbox (or inboxes, if you're signed into multiple accounts). All your other message folders—er, labels—will only be synced when you open them manually. You can set the Gmail app to sync some or all of your labels automatically, not just the inbox—and that'll give you some interesting options when it comes to email notifications (more on that in a moment). Tap the menu button in the top-left corner of your Gmail inbox, scroll down and tap Settings, then select a Gmail account. Next, scroll down to the Data Usage section and tap Manage labels. Select a label, tap Sync messages, then pick an option: None, Last 30 days (or another period of time; more on that in a moment), or All. Bonus tip: The more labels you sync, the more mobile data you'll use, so you may want to sync your Gmail labels sparingly. Want an alert when a message goes directly to one of your email folders? No problem. Now your Gmail app is syncing some of your labels, how about getting a notification whenever a new message with that label hits your account? That could come in handy if you've got Gmail filters that automatically label messages as they arrive, bypassing your inbox as a result. Go back to the Manage labels setting. Tap the menu button at the top of your inbox, scroll down, tap Settings, select an account, tap Manage labels, then pick a label that you're syncing. 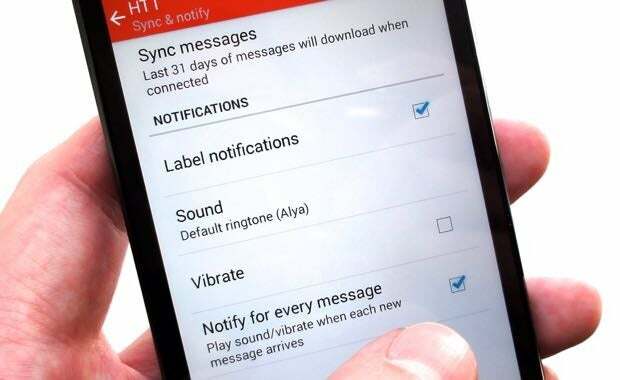 Check the Label notifications box, then choose an alert tone, toggle vibrations on or off, and decide whether you want a notification for each new message with a given label. You can decide how many messages you'd like Gmail to sync for your inbox and other specified labels. Back when we were learning how to sync messages with certain Gmail labels, one option was how many days of messages you'd like the Gmail app to sync: none, a specific number, or all. 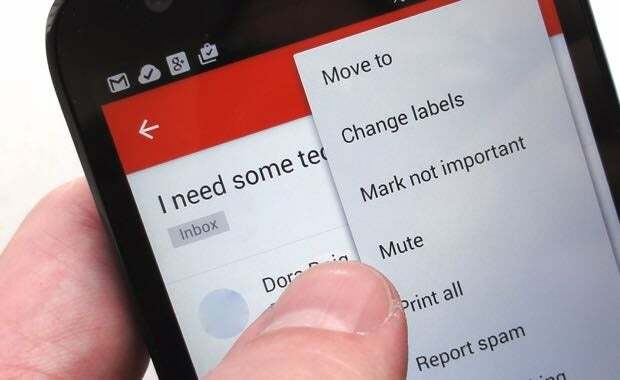 Tap the menu button in the top-left corner of your Gmail inbox, scroll down and tap Settings, then tap an account. 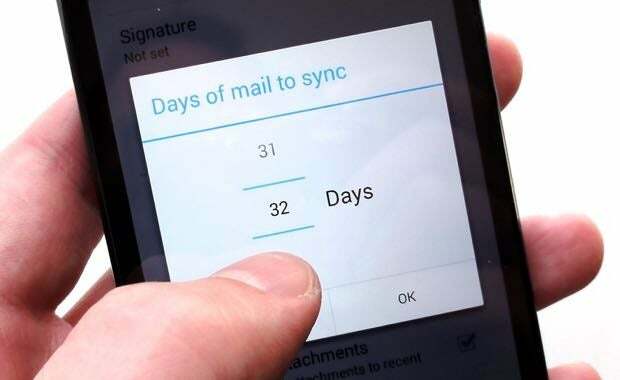 Tap Days of mail to sync and make a selection. Want to read the next message thread in your inbox? Just swipe one way or the other. Here's a handy little Gmail feature that's easy to miss. Want to read the next message thread in your inbox? No need to tap the Back button to return to the inbox screen. Instead, just swipe from right to left (for older threads) or left to right (for more recent threads). 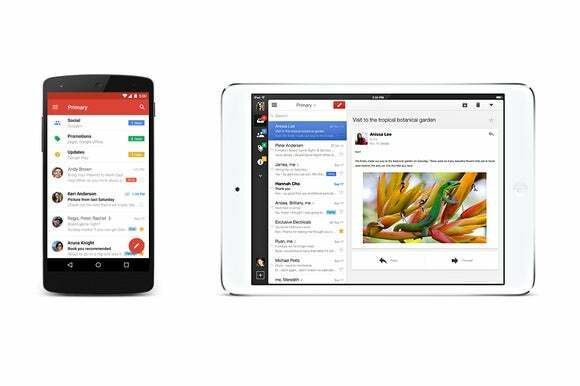 You can attach massive files to email messages from the Gmail app, all with a little help from Google Drive. With a little help from Google Drive, you can send a massive file—as in, say, more than a few GB—to a friend via email, or deliver a large batch of files. Don't have a Google Drive account? Well, if you're using Gmail, you've actually got one already. First, you'll need to load the files you want to send into Google Drive. Open your Google Drive account, then drag the file you want to send onto the web page. The file should begin uploading automatically. 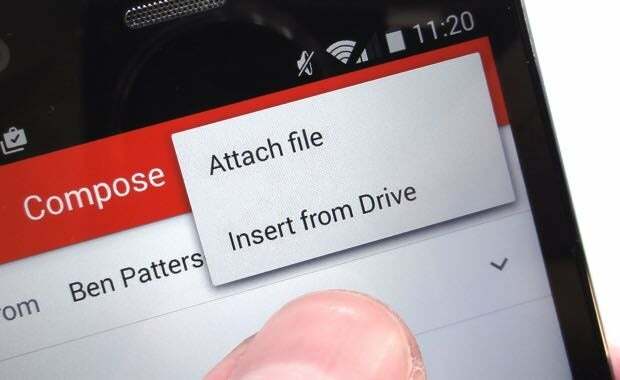 Next, open the Gmail app, compose a new message or reply to an existing one, tap the Attach button (it looks like a paperclip), then tap Insert from Drive. Find the file you want to send, tap it, then tap the Select button (for Android) or the curved arrow (on iOS). The Gmail app welcomes email from other accounts, not just Gmail. Isn't it friendly? Nope, Gmail isn't just for Gmail any more. 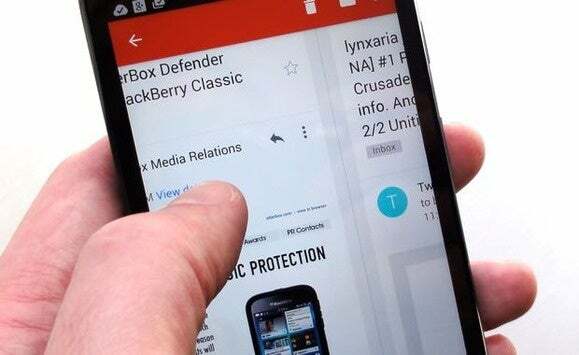 The latest version of the Gmail app for Android lets you add non-Gmail email accounts, such as Yahoo Mail, Outlook, or any account that supports the POP or IMAP email protocols. 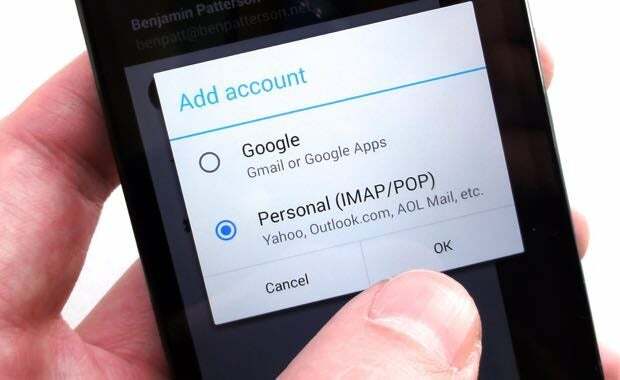 Just tap the menu button in the top-left corner of your inbox, tap your email address, tap Add account, select Personal (IMAP/POP), then tap OK.
For popular email services like Yahoo and Outlook, Gmail should be able to guide you through the setup process using nothing but your email account and password. Otherwise, you may need to know some other information, such as your email provider's POP and IMAP settings. For those details, check your provider's Help pages.